36000, 36500 series balancing valve in carbon steel. PN 16, PN25, PN40 (subject to size) DN 15 – 400 Media Temp. -20˚C +200˚C (-40˚C is available as an option). 36000 has weld connection for EN10216-2 and EN10217 steel tubes and 36500 has flanged connections. 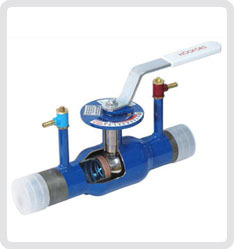 This balancing valve is an ideal multi-purpose, on-off and control valve which can be used in pipelines for balancing.